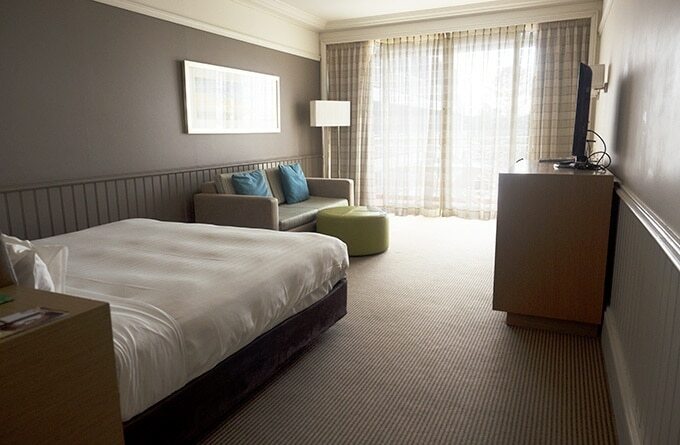 Crowne Plaza Terrigal is a two hour drive from Sydney and located right on Terrigal Beach. Making it the best Terrigal accommodation for a weekend escape. Flocking to the beach in summer is an Australian past time. Heading away for a summer beachside stay is also a highlight escape for most of us. As much as I love the beach in summer, I find something quite special about a seaside escape in winter. Little townships that explode in population during the peak of summer are quite and relaxed. It may be too cold to plunge into the ocean, but I find long quite walks along the beach way more enjoyable in winter. 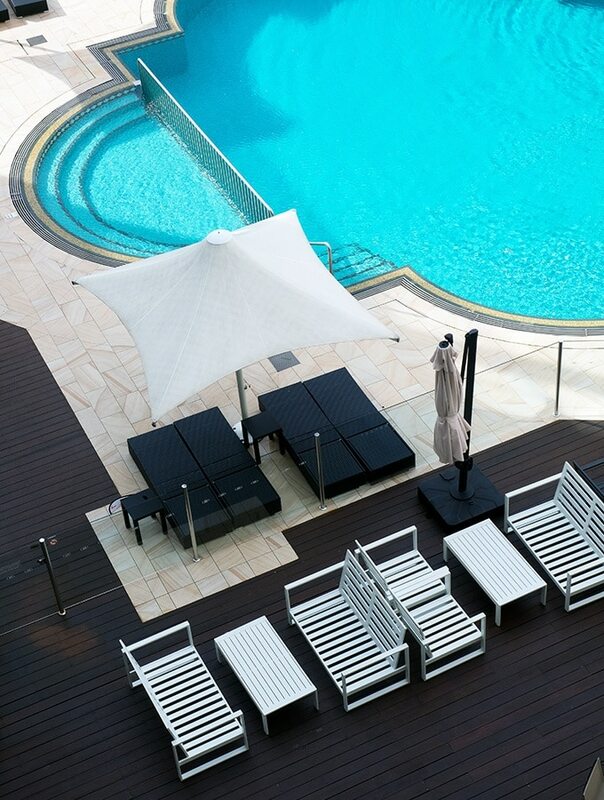 If it is a gorgeous sunny winter’s day, you may find your hotel pool is heated for a swim. 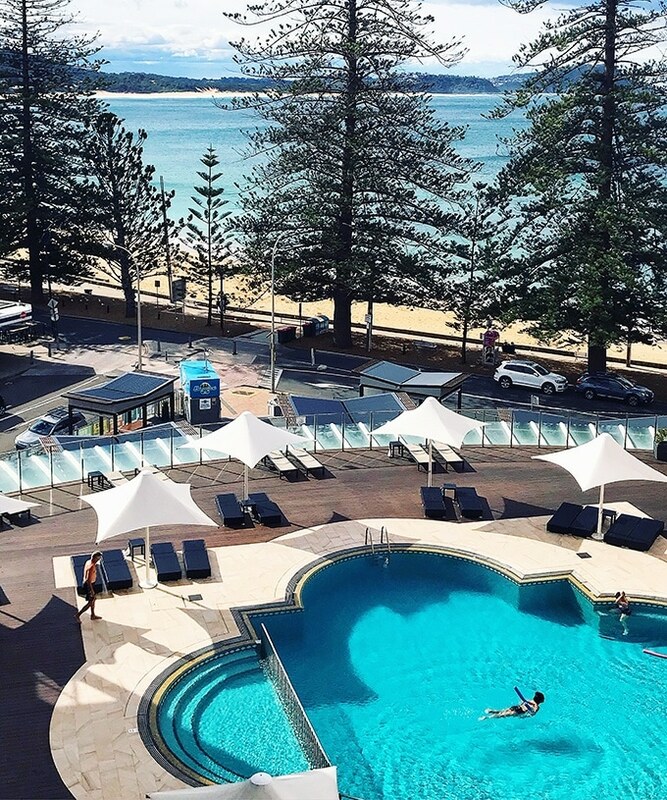 Luckily in our case the Crowne Plaza Terrigal has a heated pool which has the bonus of looking out over Terrigal Beach. Where is Crowne Plaza Terrigal anyway? Crowne Plaza Terrigal is located right on Terrigal beach. 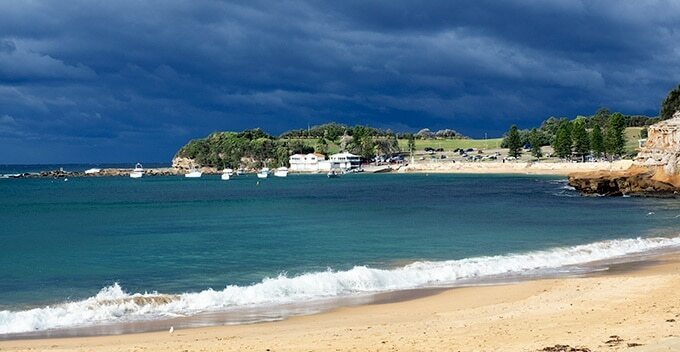 Terrigal is one of the villages that make up the Central Coast of NSW in Australia. A very popular tourist destination in summer where locals flock for the summer vacations. It is just as fun to visit in winter, plus there are less tourists. 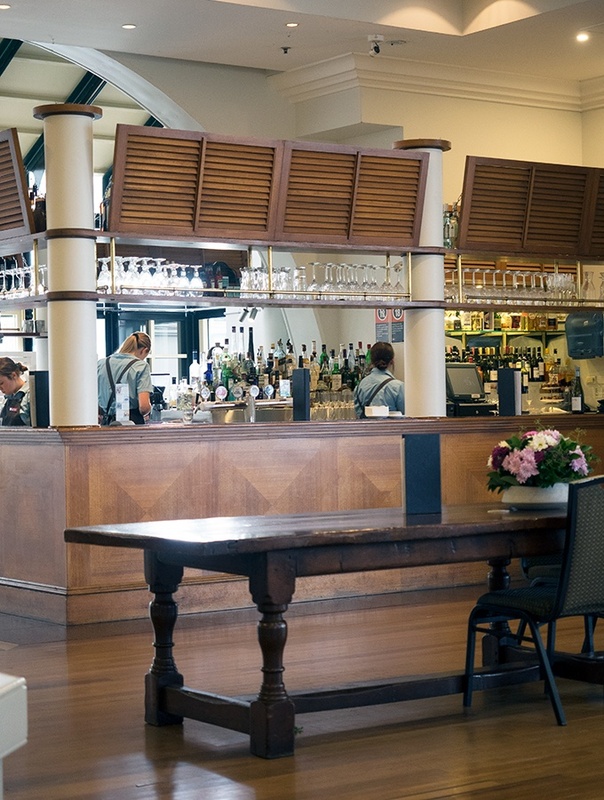 You can entertain your time bushwalking, visiting local markets, numerous art galleries, mountain bike riding and of course great little restaurants and bars. 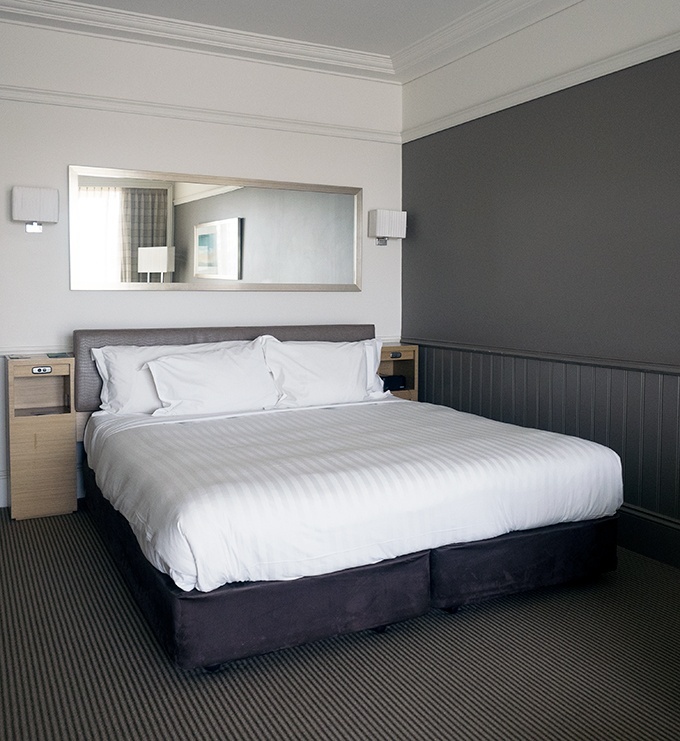 What’s the accommodation like at Crowne Plaza Terrigal? There are standard rooms, pool view rooms, ocean view rooms and suites available. On this occasion we stayed in a pool view room which also had views over Terrigal beach. 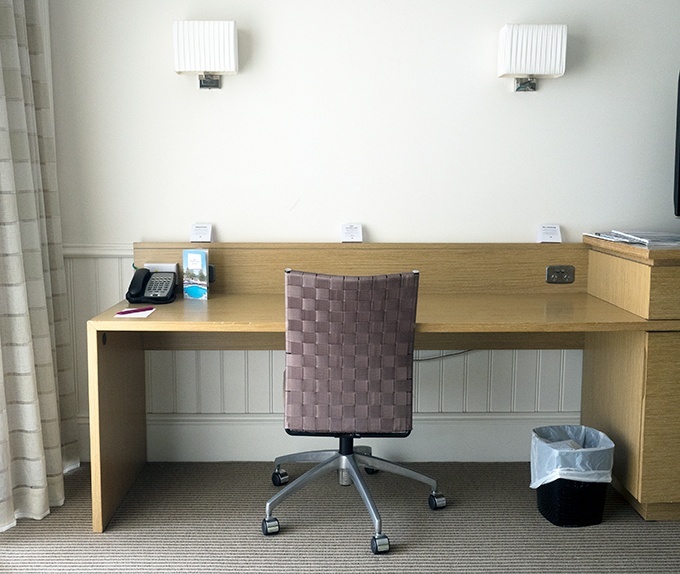 The room was spacious with a king size bed, lounge, writing desk, mini bar and television. There was also a balcony with table and chairs for two, where you can relax and look out over the pool and beach. A natural colour scheme accented with blues and greens fits in perfectly with the hotel’s beachside position. 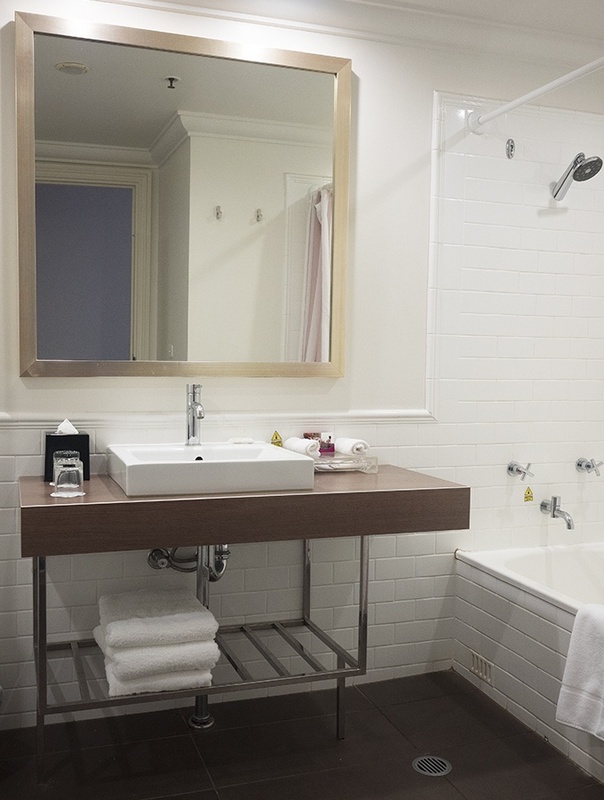 The bathroom has a minimalistic style and is as generous in size as the rest of the room. 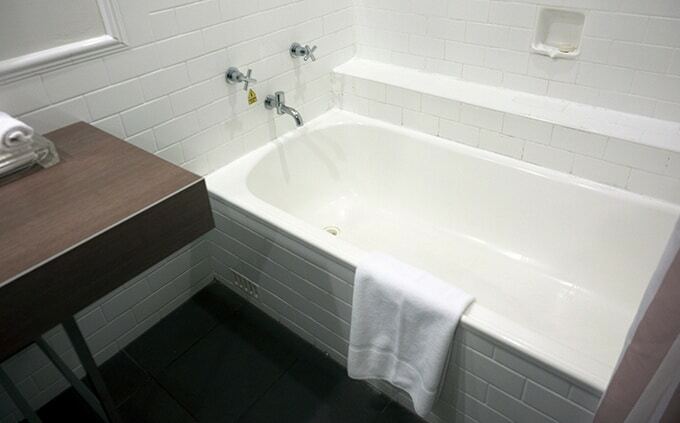 There is a bonus of a bathtub for those that like to soak. The only downside to this is that it is a bath/shower combo. Totally fine for us, but may be an issue for those that have problems stepping into a bath to shower. 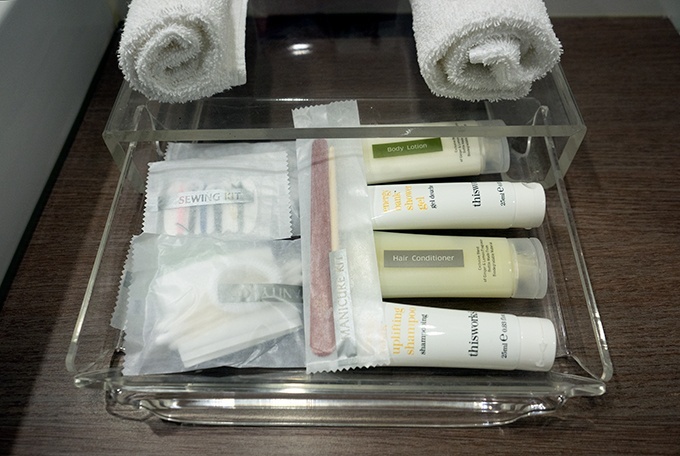 They have you covered amenities wise as well, from nail files to sewing kits. In the wardrobe you will find dressing gowns and slippers for your comfort. That is where they stash the safe and iron as well. If you are escaping for the weekend, then a trip to Endota Spa may just be what you need for total relaxation. They are open seven days a week and offer the usual suspects in spa treatments. Feel like keeping fit? Aqueous Health and Fitness Club has you covered. There is gym equipment, weights, spa pool, sauna and steam room. It is here that you also have access to the large outdoor heated swimming pool. Travelling with kids? Crowne Plaza Terrigal’s Kids Zone has you covered. It is open seven days a week during school holidays for children aged five to 12 years. 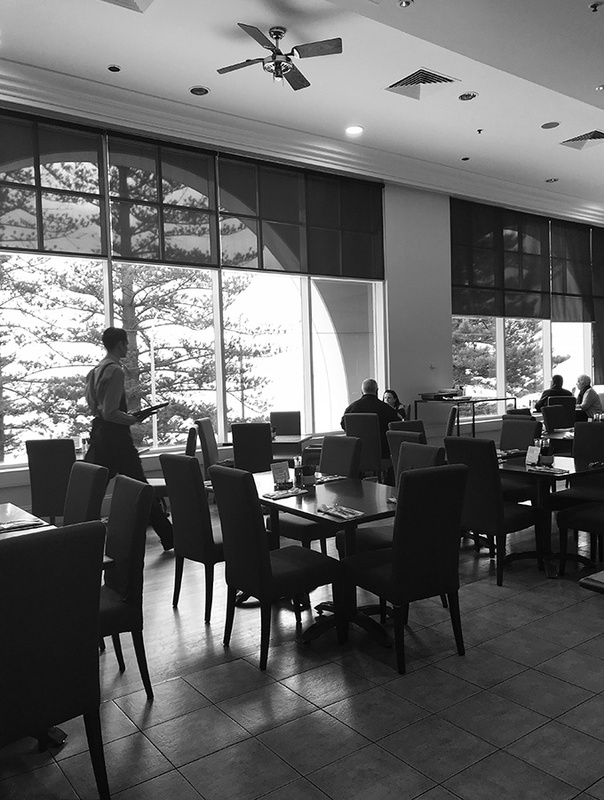 How is Crowne Plaza Terrigal going to satisfy my belly rumbles? Due to a rainy and miserable afternoon, we escaped to Lord Ashley for a few drinks and some bar food. It was quite busy when we visited as quite a few people were enjoying the high tea offering. There seemed to be a lack of tables and chairs in the main bar section, and I wonder if some of them had been repurposed for the Peter Kuruvita event later that afternoon. 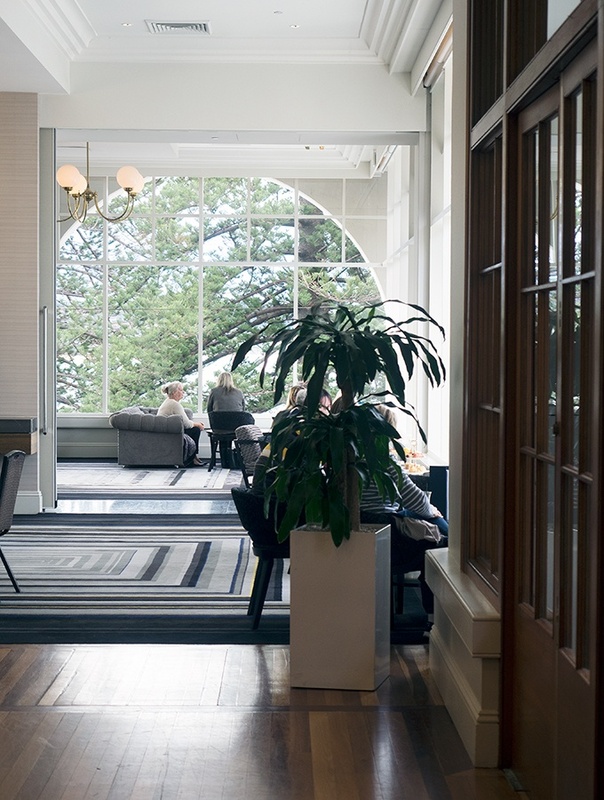 The best place to sit would be on the lounges and chairs that overlook Terrigal beach. Unfortunately for us it was at maximum capacity, so we grabbed the last free table in the bar area which is next to the pool. The decision was made on sangria and cheese plate. Quite perfect for a relxing rainy afternoon. 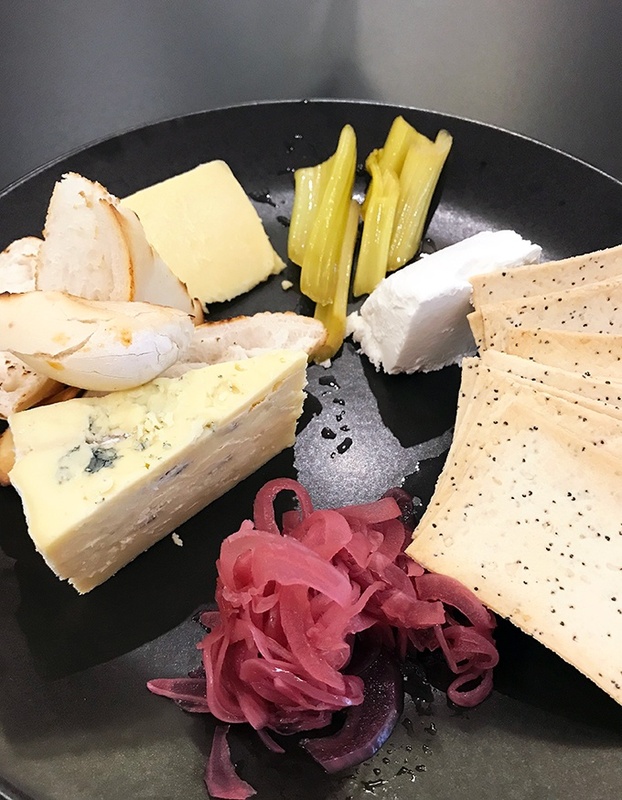 What really impressed me was the pickled celery. It is the first time I have tried it and I am completely won over. Feeling like something a little more we ordered a bowl of hot chips. 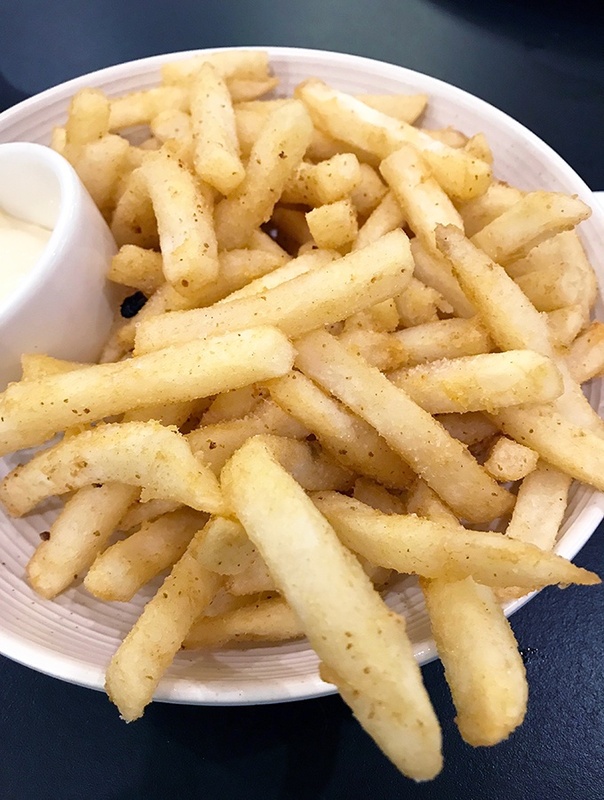 Quite crunchy and seasoned well with a side of garlic aioli to dip them into. It was also the perfect opportunity to try a cocktail. Let’s just say, I had a very nice nana nap before dinner. We did stick our noses in but decided Lord Ashley was more for us. There is a large uncovered area which would be perfect during summer or if it wasn’t raining (as it was in our case). There are also tables inside. The place really comes alive in the evenings with music and dancing. The locals were lining up to get in on the Saturday night of our stay. On the second Friday of the month Florida Beach Bar & Terrace also host the Greedy Guts Street Food Markets. Important note for those staying at the hotel. During the day you can access the hotel via the Florida Beach Bar. 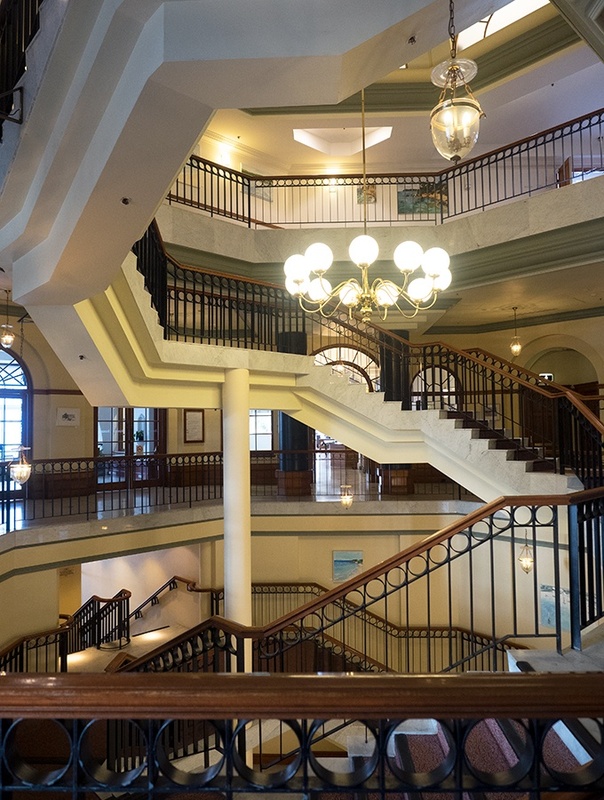 In the evening access is closed off and you will need to walk around the block to the main hotel entrance to get in. We were staying the weekend for a special Sri Lankan dinner by Peter Kuruvita at Seasalt restaurant. Therefore, I didn’t get to try their normal menu for dinner, but we did enjoy breakfast. Seasalt looks out over Terrigal beach and is a light, bright and airy space. For breakfast they offer an extensive buffet. There are a wide variety of hot food offerings to cover all sorts of taste bud needs. There are the expected, baked beans, bacon, hash browns, mushrooms. They offer two kinds of sausages, one pork the other chicken. The mushroom and spinach frittata use local eggs. Surprisingly the scrambled eggs were quite okay for a hotel buffet breakfast. Some of the more unusual hot items were onion pakora, sauteed beef, fried chicken and egg and bacon fried rice. 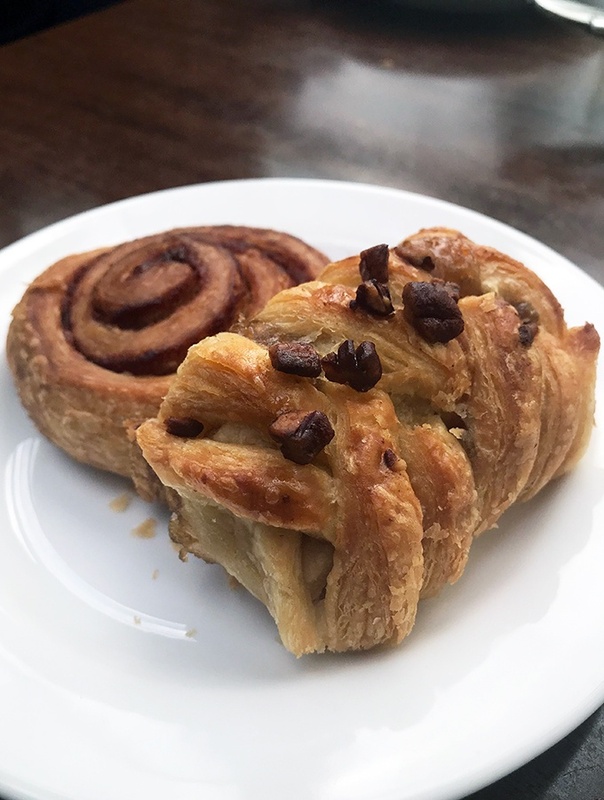 Pastry and bread lovers are also well catered for. 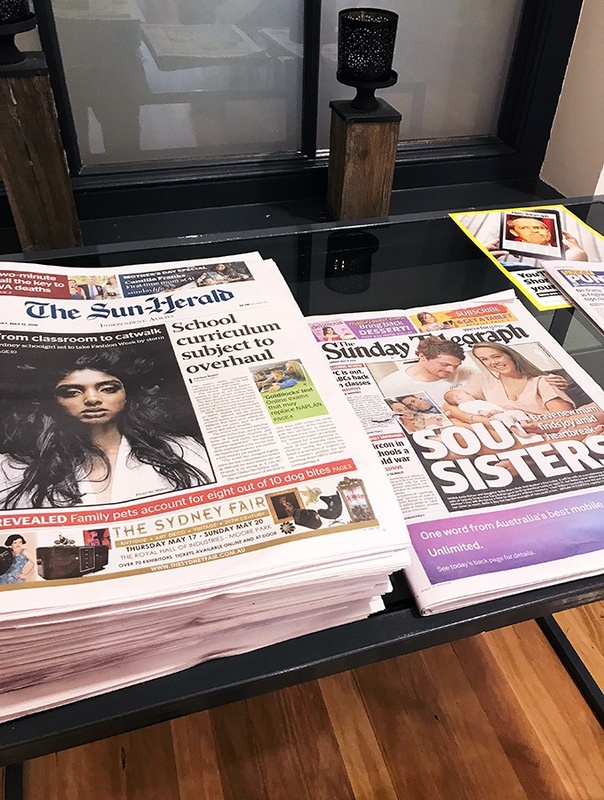 There is a good selection to enjoy over the weekend papers. Big brownie point too for keeping the gluten free bread away from all the other bread. It is available on request, which means it is safe from contamination. 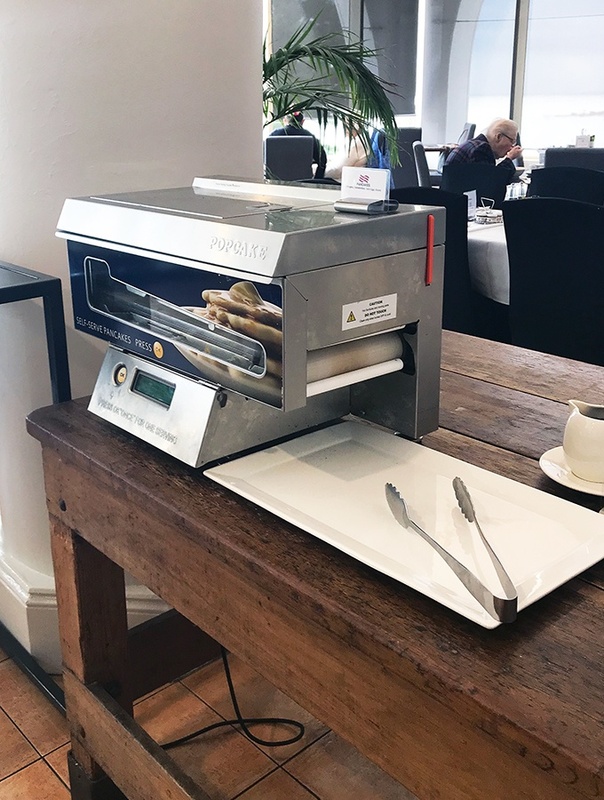 Quite a few people were surprised by the pancake maker. For a moment I felt like I was in the Qantas lounge where they have been a staple for many years. But for those that have not seen or used one before they are dead easy master. Just push a button and it will make a fresh pancake for you. 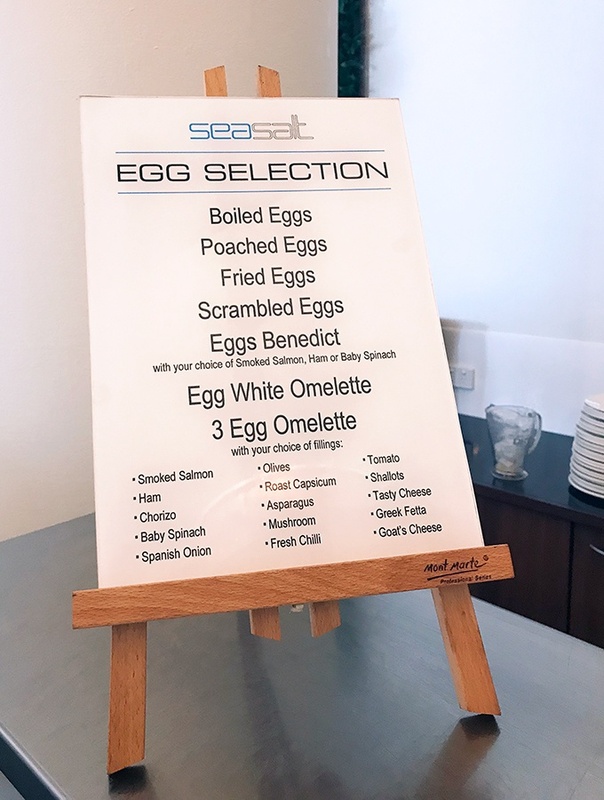 Seasalt have a manned egg station where you can order your eggs pretty much any way you want. I decided to give their eggs Benedict skills a try. Order what you would like and you will be given a number to put on your table. 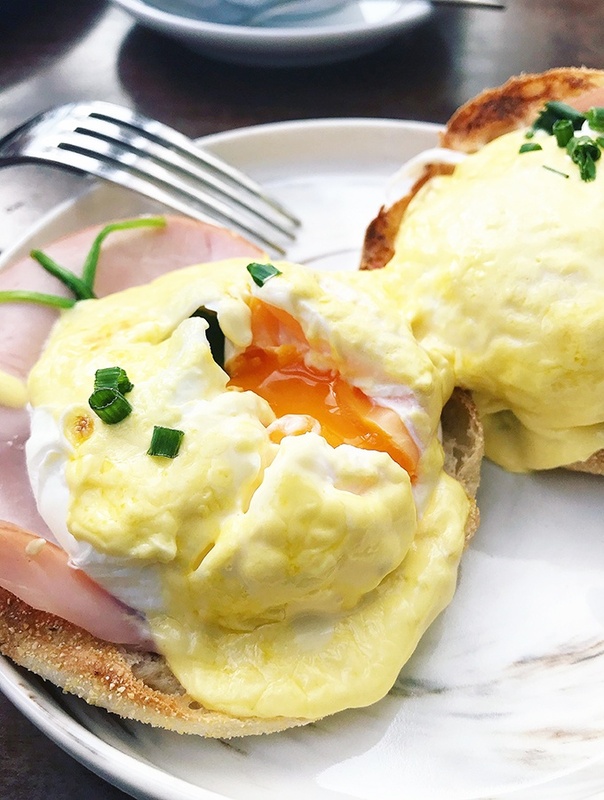 Head back, relax and wait for your eggs, or in my case eggs Benedict to be delivered. As you can see the eggs were poached just how they should be, yolks still runny. But man, or woman, cannot live on eggs Benedict alone. We also sampled from the buffet. It was great to see that they use local Port Stephen’s eggs in the frittata. You can have a nice sleep in on Sundays as the breakfast buffet is open until 12 noon. Not staying at the hotel? 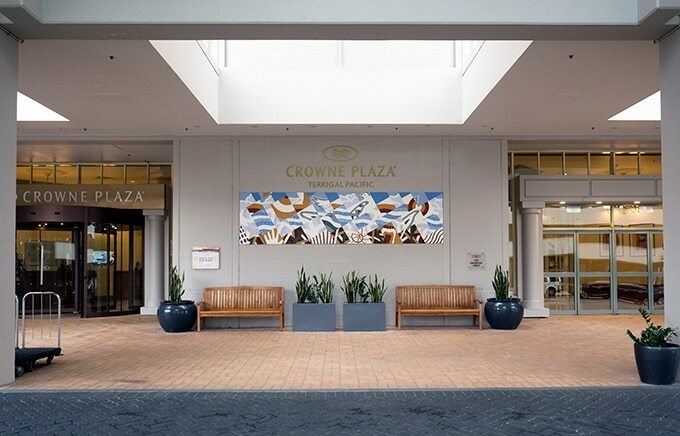 Crowne Plaza Terrigal offers free parking, just be sure to get your parking ticket validated to avoid paying $25. 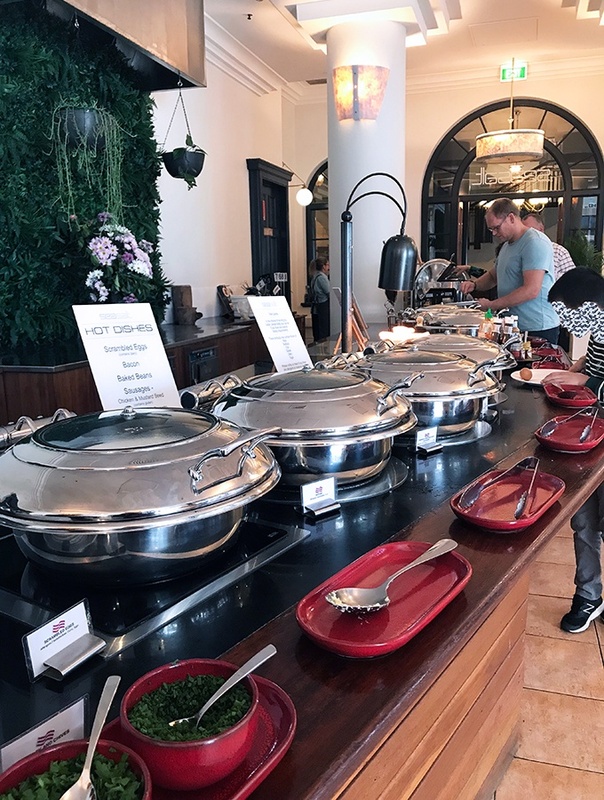 The buffet breakfast is $39.50/person. But if you are a Central Coast local you will only pay $29 (not valid on public holidays or during special events). 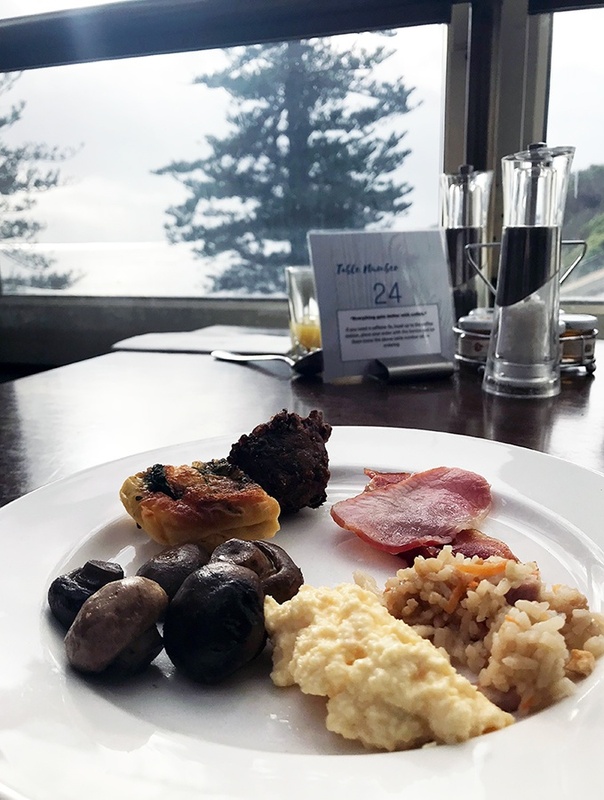 Why Should I stay at Crowne Plaza Terrigal? Location, location, location. It really is in a prime position on Terrigal Beach. You are also in walking distance to various nightclubs and good restaurants. 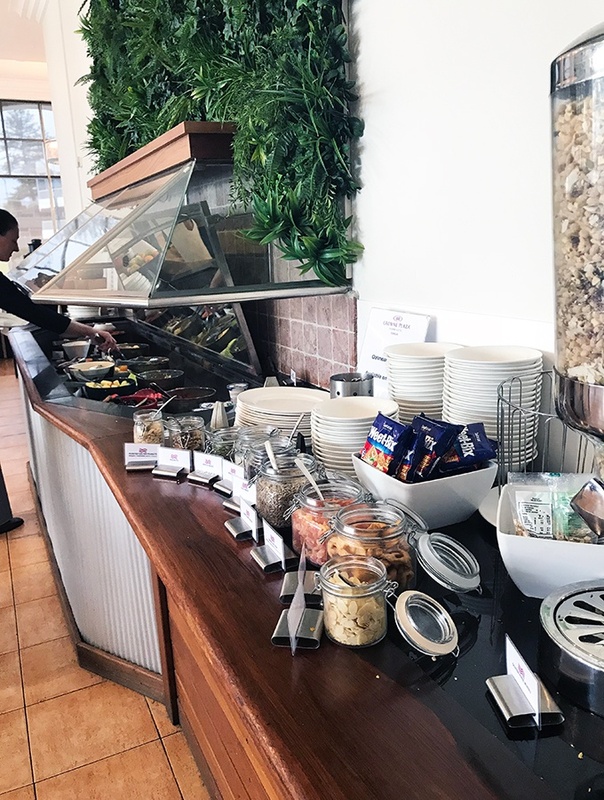 If you are after a larger scale establishment, that has a good offering of hotel facilities then Crowne Plaza Terrigal is the pick in the area. 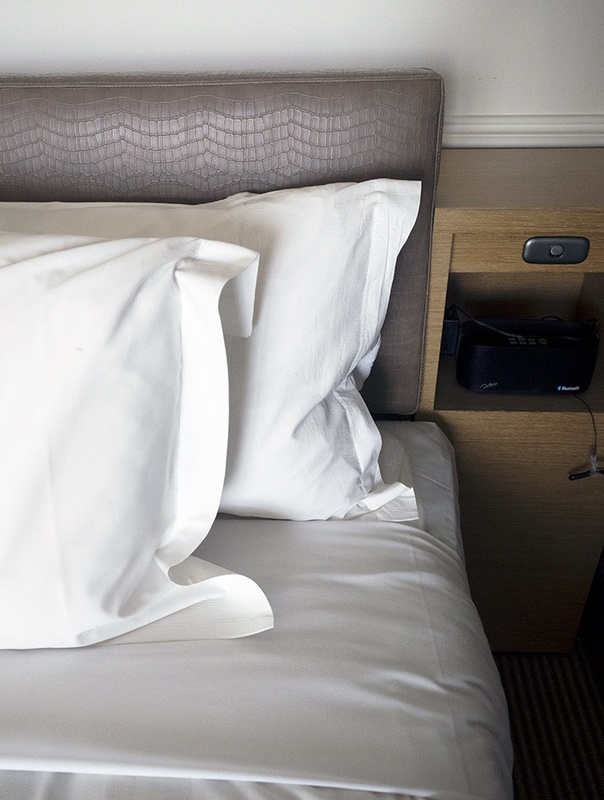 The accommodation as a whole is very comfortable with more than one dining option open to hotel guests. 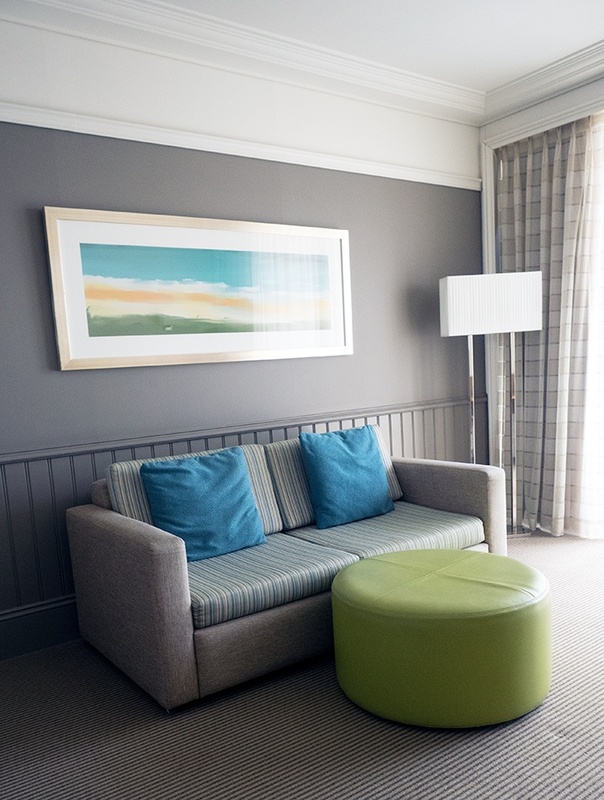 Tips for your stay at Crowne Plaza Terrigal. Crowne Plaza Terrigal is an IHG hotel. If you are not a member then join, it’s free. 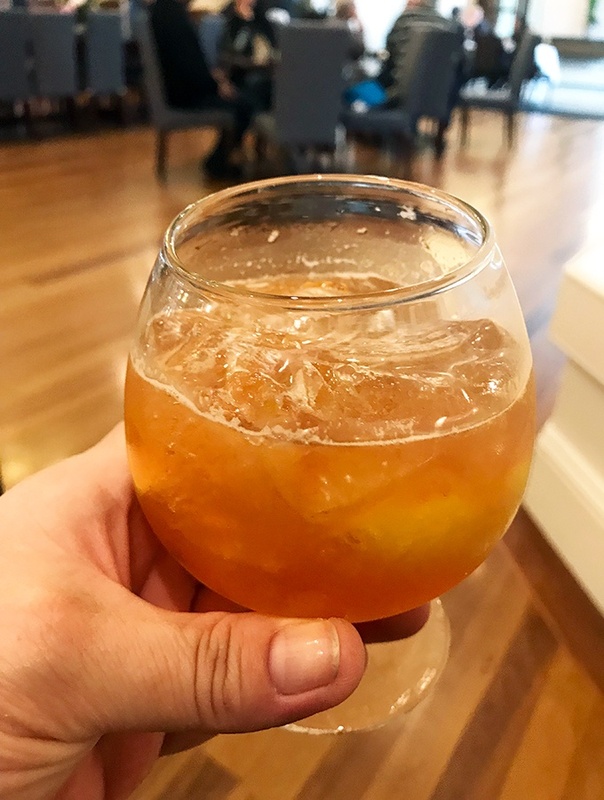 By being an IHG member you are entitled to free Wi-Fi, complimentary paper, late check out (if available) and welcome drinks. Plus, there are other advantages. 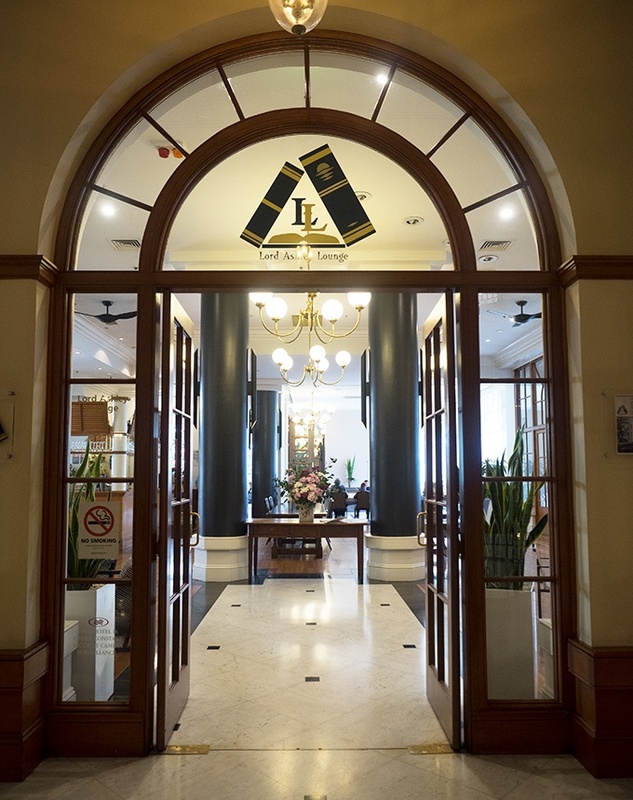 Check out TripAdvisor for more reviews, photos and rates. I guess if that is where everyone seems to go to in the summer, then that is the perfect place to go to in the winter. Have it to yourself kinda. The spread of food they had looked good. Glad you found a place to go when it was a dreary day out. Nice clean lines in the decor. The view overlooking the ocean is fabulous. 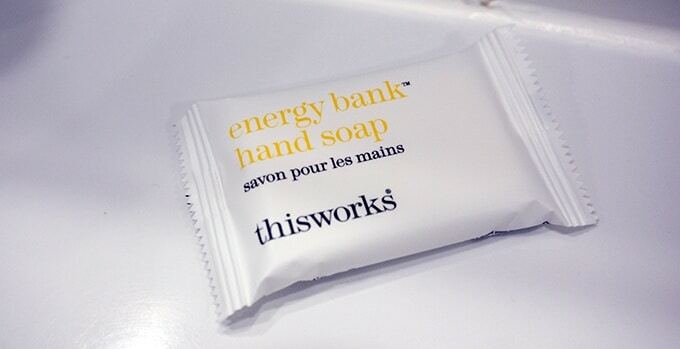 I would hoard all the energy soaps in the bathroom. 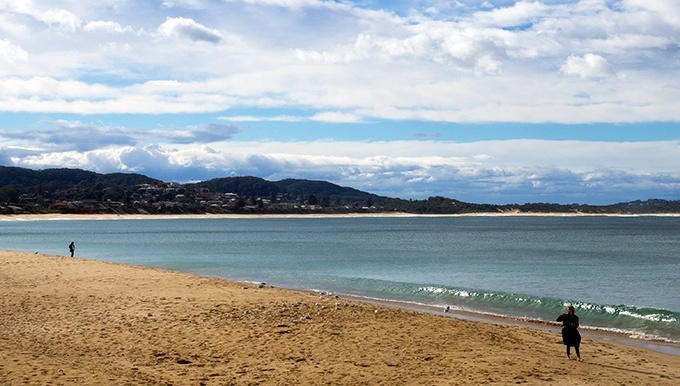 Terrigal Beach looks like the perfect escape. 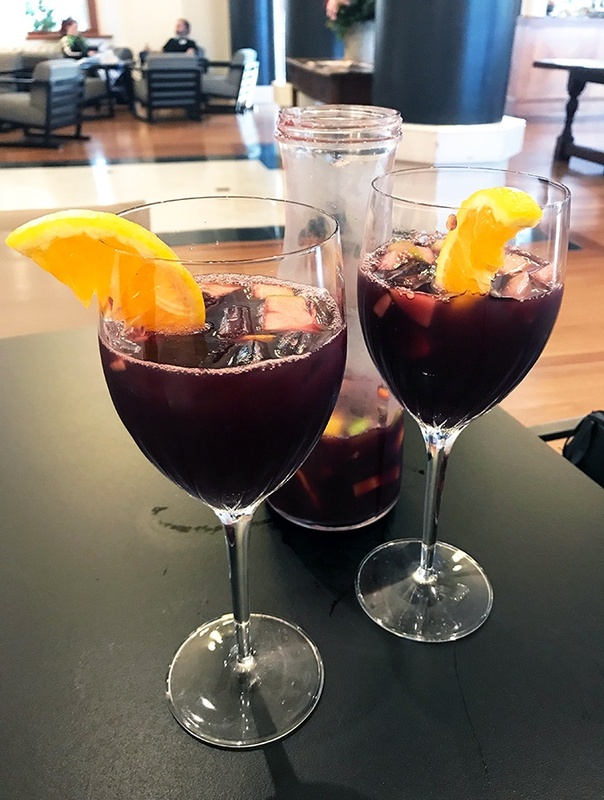 A good beach, big pool & sangria… What else can you ask for? 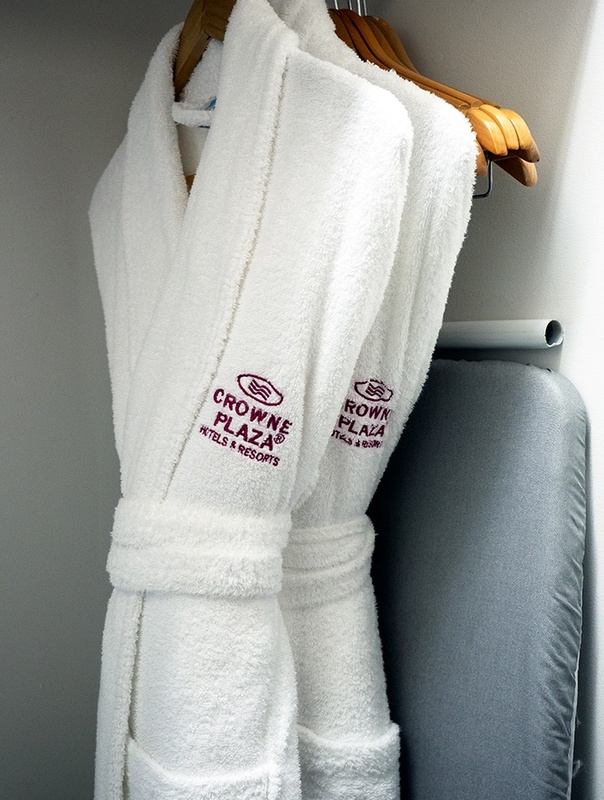 Also like the big fluffy robes…a must in any luxury hotel! This looks like an amazing place for a weekend getaway! The pool looks so beautiful! 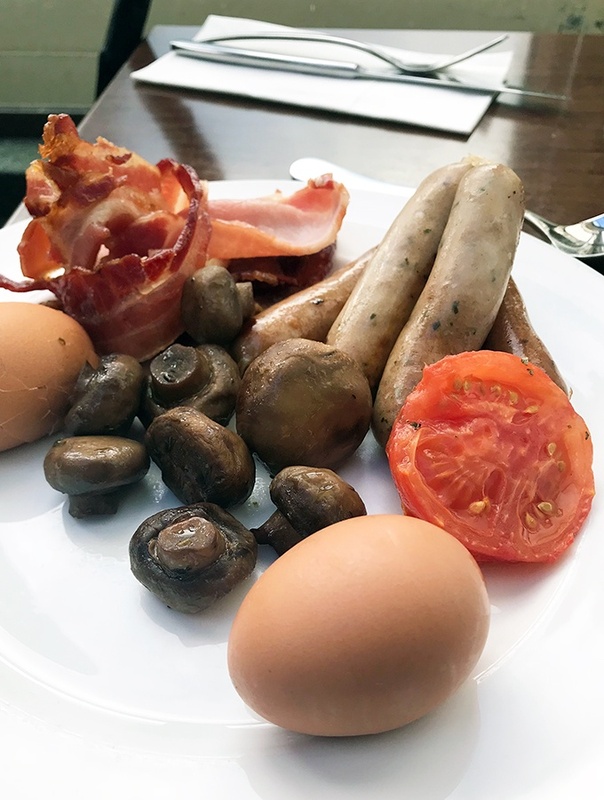 It’s not often that a hotel breakfast makes my mouth water, but that totally does! The sangria and cheese plate looks divine! The best thing is when there is a great breakfast option available! I find that so important and sometimes quite rare! Now I would like to try some pickled celery. Love the modern and minimalistic style of the property. That pool is calling to me, so is the sangria. 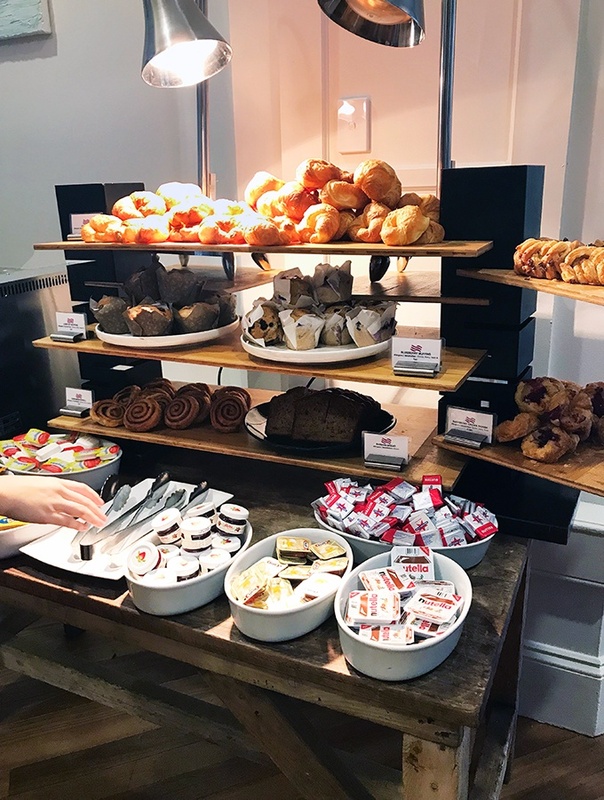 It’s important to me to have a decent breakfast available at the property I stay in and the breakfast buffet looks perfect. Have stayed in one of the hotels of this chain in Venice. Reminded of the warm hospitality there. The food spread looks yumm, completely won me over. You surely enjoyed your winter weekend getaway. 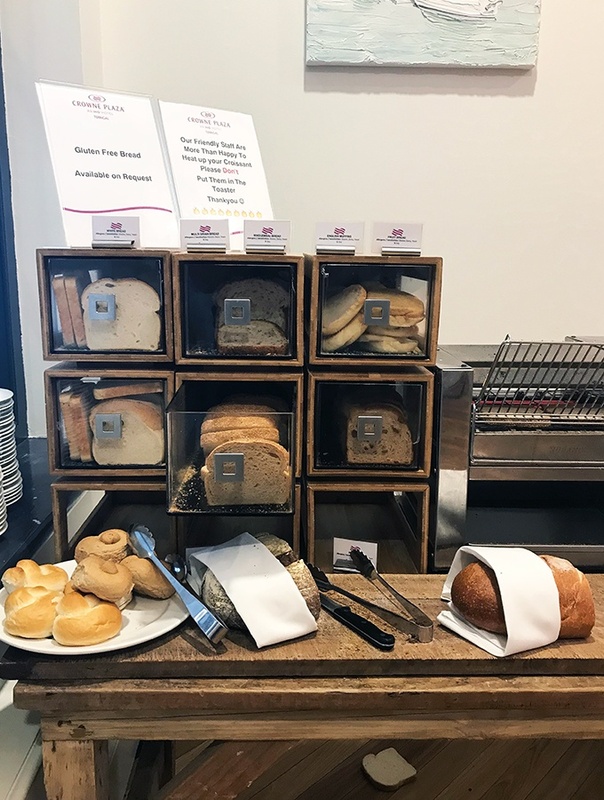 Sounds like Crowne Plaza had everything your belly needed! Somehow I find that Winters are best spend at beach on a clear sunny day. Heated pool is always a preferred and trust it is always soothing and relaxing for body and soul. Crowne Plaza at Terrigal looks awesome loaded with almost everything like Gym, Kids Zone, Spa etc. I have stayed in few Crowne Plaza and recently at Dubai too and find them all good. Location looks awesome. If ever I go there, I shall stay in this hotel only for sure.